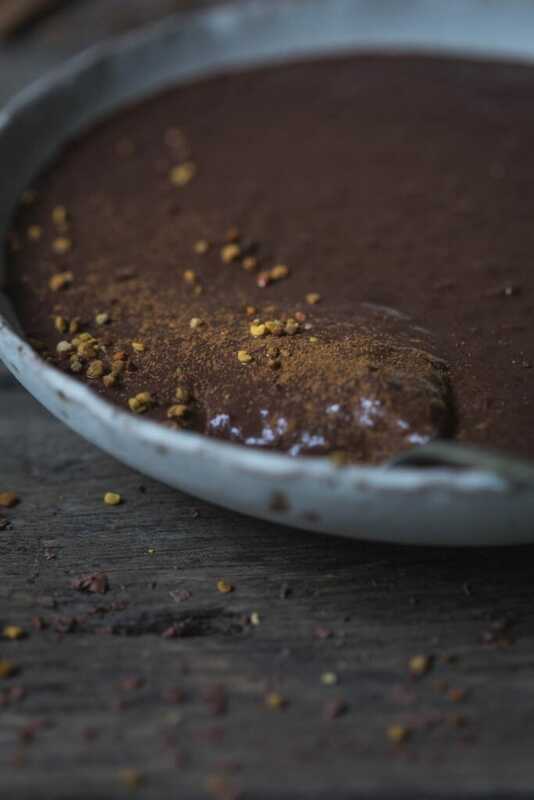 With an exotic hint of cinnamon, cayenne pepper and sea salt, this Mexican Inspired Chocolate Chia Pudding is a perfect healthy breakfast indulgence or anytime treat. Made with whole ingredients and no added sugar, this gorgeous chocolate bowl is wickedly good, in every way. I have learnt a lot navigating this food blogging world. While some challenges, like photography and blog techno-thingys, could be methodically approached thanks to Google and YouTube, other lessons have been less surmountable. Some things have been down right confronting. In the past twelve months or more I have discovered my fifteen year-old self lurking around the fringes of each post. Each time I hit publish, she floods my head with doubt. “What if they don’t like this one?” “Why don’t my photographs look like [enter favourite blogger here]?” “How can I get them to like me more?” “And how will I know if they do like me?” Oh, that’s right, Facebook likes equals popularity. Starting from my earliest posts I can see other bloggers’ influence in the images and words; bloggers I believed were doing it better than me. My fifteen year-old self followed the cool girls. She submitted to Foodgawker desperate for their approval; determined to be accepted in to their gallery of best photographers. She trawled the Internet to see what the ingredients du jour were and bought them all. In time, she did make it to Foodgawker. She created a gallery full of images they liked. Other bloggers asked how had she done it, what advice could she offer? Her blog grew. The thing my fifteen-year old self doesn’t understand is that she’s not more popular if it isn’t really her on the page. Thankfully but also a little painfully, my adult self does understand this. In the last few months my style has changed, the Google ads have been removed and my blog is more pared back. My images are more earthy, softer and more muted; Foodgawker doesn’t like them. But I do. I also like burgers more than tahini, pasta more than quinoa and I don’t do yoga. And I like chocolate…I really, really like chocolate. Maybe somewhere in all this, there is a middle ground. 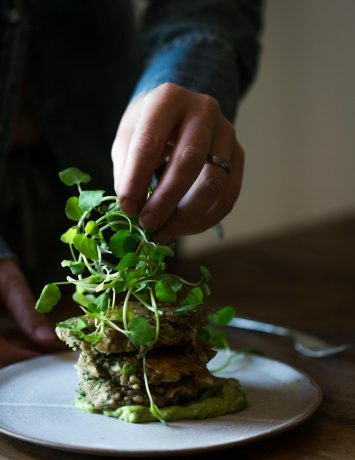 Completely delicious food that at least tries to be healthy and a blogger willing to share herself completely, jiggly bits and all. The fifteen year old is still here wanting to be popular and that’s OK. She’s fun and always tells me when my bum looks big in something. And now to the chocolate. 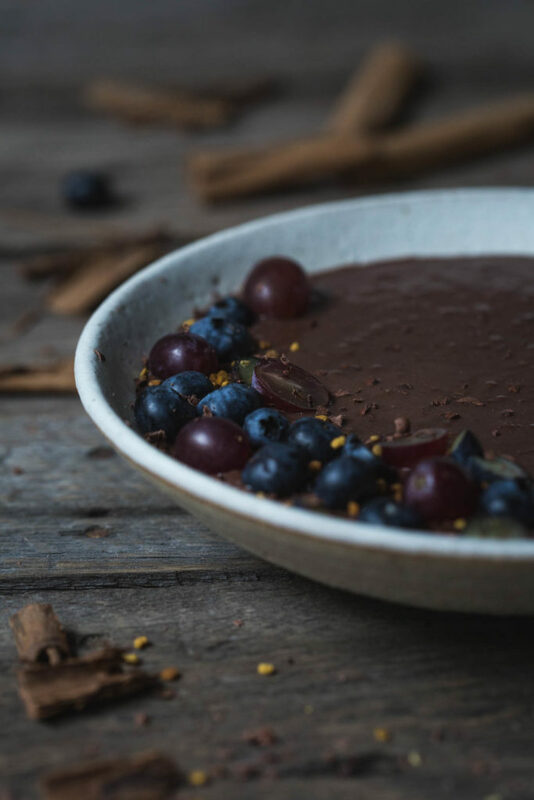 This Mexican Inspired Chocolate Chia Pudding celebrates all the wonderful flavours of a Mexican style hot chocolate. 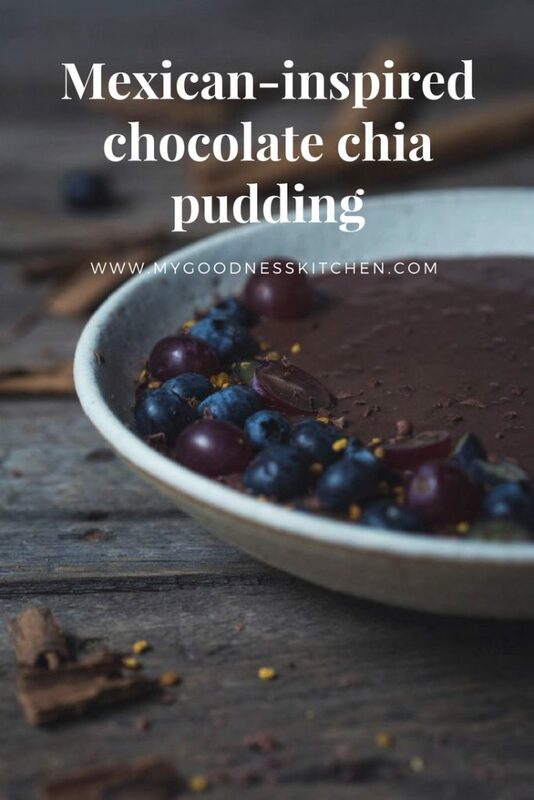 Rich, creamy chocolate pudding, laced with a hint of cinnamon and a little cayenne heat, is brought to life with a pinch of sea salt and the smallest hit of coffee. 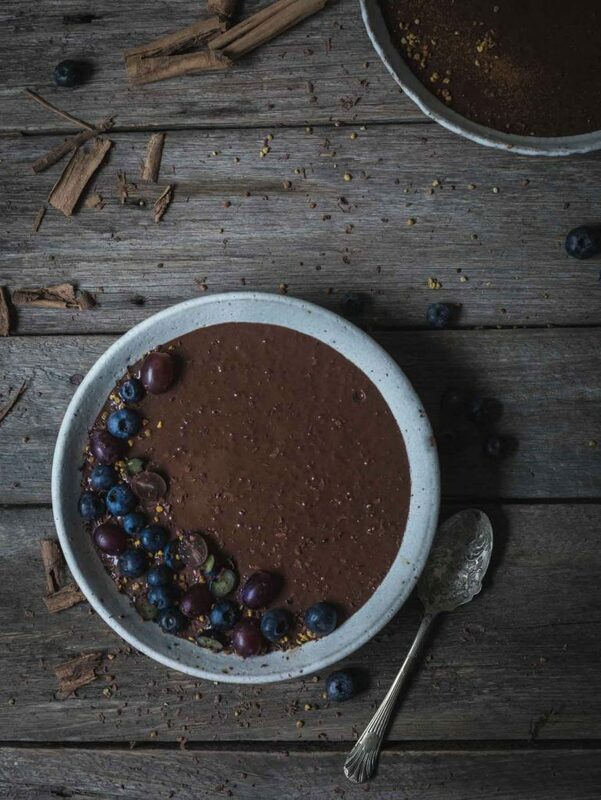 Sweetened with banana and dates, this dreamy, decadent bowl is actually, dare I say, healthy. But, more importantly it’s chocolate and it’s delicious. 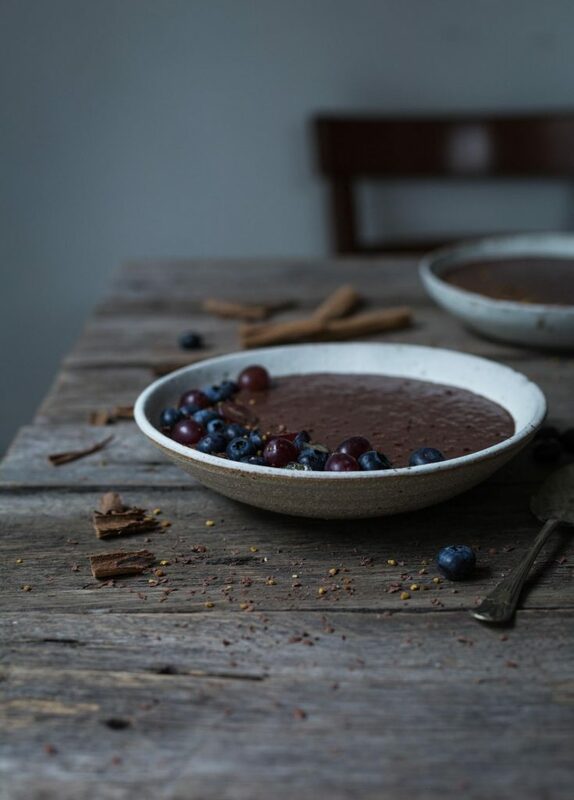 With exotic cinnamon, cayenne pepper and sea salt, this vegan Mexican Inspired Chocolate Chia Pudding are a perfect breakfast indulgence or anytime treat. Pour the mixture in to either two bowls or three glasses. Cover with foil and place in the fridge to set overnight or for at least four hours. 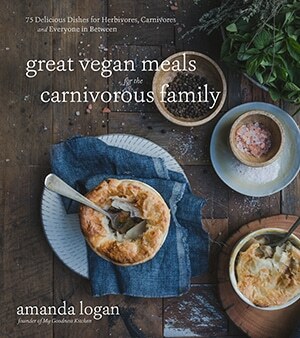 Serve with your choice of fresh fruit, dark chocolate shavings, granola or buckinis. For added indulgence, serve with whipped vanilla coconut cream. and to the adult – I like the way the blog is now. please keep doing it this way. and to the bother you enjoy your pudding. Oh, thanks so much Jacquie. That’s so kind of you. I like my fifteen year-old too. She worries too much about what others think but her intentions are good. Stay well and thank you again.